Ty’n Rhyl, the building set back from Vale Road here, is reputedly the oldest house in Rhyl and contains what may be part of King Henry VIII’s bedstead. The town stands on what was once sea-level marshland, which was liable to flooding by rain, river and sea. In 1794 a Parliamentary Bill allowed for embankments to be made, to protect the land from the sea, and for drainage channels to be cut. Prior to this, Rhyl consisted of just a few fishermen’s cottages, some farms and one big house – Ty’n Rhyl. The house dates back to 1672. According Llew Glas, a local historian in Victorian times, the date 1680 was visible above the stable door until c.1885. An architect had told him that the oldest part of the house was built with fragments from Rhuddlan Castle, as evidenced by a long stone whose curvature corresponded with that of some of the castle towers. Ty’n Rhyl was the home of writer Angharad Llwyd from 1841 until her death in 1866, aged 86. She was a member of the London Cymmrodorion Society and won several gold and silver medals at eisteddfodau for her essays on Welsh history. Many of her manuscripts are preserved in the National Library of Wales, Aberystwyth. She often wrote the house’s name as “Tŷ yn y Rhyl”. The internal window shutters in the house’s snug are decorated with pictures and mottos painted by Angharad Llwyd. 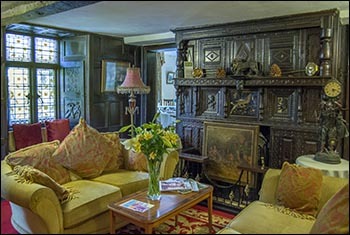 The wooden fireplace surround in the hall of Ty’n Rhyl is thought to be made from the bedstead used by King Henry VIII and his first wife Catherine of Aragon. Angharad Llwyd’s ancestor Pierce Griffith was the king’s Sergeant at Arms and usher to Catherine of Aragon. The fireplace (on the right in the photo) also features a picture of a bird made from Italian marble. Today the house is home to Barratt’s at Ty’n Rhyl, a restaurant with rooms. Ty’n Rhyl once had several acres of land, some of which is probably now occupied by the Botanical Gardens.